I live in a country where elected millionaire representatives, purportedly representatives of the people, cannot agree on securing the country and protecting the citizens they are supposed to protect. What is their purpose? Does anyone know? They’ve or we have given them many labels: Conservative, Liberal, Progressive, Socialist. Communists too, but they won’t outright admit it. But I must tell you it’s getting more difficult each day to sort them out and place those who belong there into the human looney bin. Maybe it’s the whole lot of them. The meaning of any of these labels is long lost. You can put all of them under one column labeled politicians synonymous with liars, crooks, and flimflam artists. We cannot evaluate them based on what comes out of their mouths but rather what they achieve for the good of the country. I don’t like to paint with a broad brush. I know there are many who go to Washington with the right intentions only to find out, aside from political and ideological divides, there is an impenetrable establishment wall. It’s the only wall Washington has ever managed to construct. It protects them from outsiders. If only our borders were the same. Their options then are to leave Washington after a term or become a lockstep establishment drone. Most decide to stay. We have a new crop now. They are fearless, or maybe stupid depending on your perspective, when it comes to sharing their socialist, communist, progressive views of the world. I don’t think they’re stupid. I’ll tell you why. The 1960’s radicals found their way back to the universities and succeeded in pushing conservative thought (the Constitution, free market capitalism, American Exceptionalism… you name it) out along with any professors holding those views. As time went along, they became more entrenched evidenced by faculty endorsed near riots when conservative speakers show up on campus. For decades, they’ve been “taught” about the social injustice of capitalism, they cannot define American Exceptionalism, our constitution is a dated document that doesn’t apply to the new world globalist environment, the virtues of socialism and its accompanying egalitarian paradise (although they probably cannot define egalitarian), revisionist history heavy on the failings of the founders, that God is dead or never was, killing unborn children is a woman’s health choice, and that old white men are the scourge of the planet. What they haven’t learned is that these progressive ideals wrapped in their utopian socialist bubble always, without fail, lead to tyrannical government and mass death. The evilest of the evil, Hitler, Stalin, Mao all made the same promises. Even when tried by modern day politicians considering themselves smarter and more enlightened, they still fail. Always. 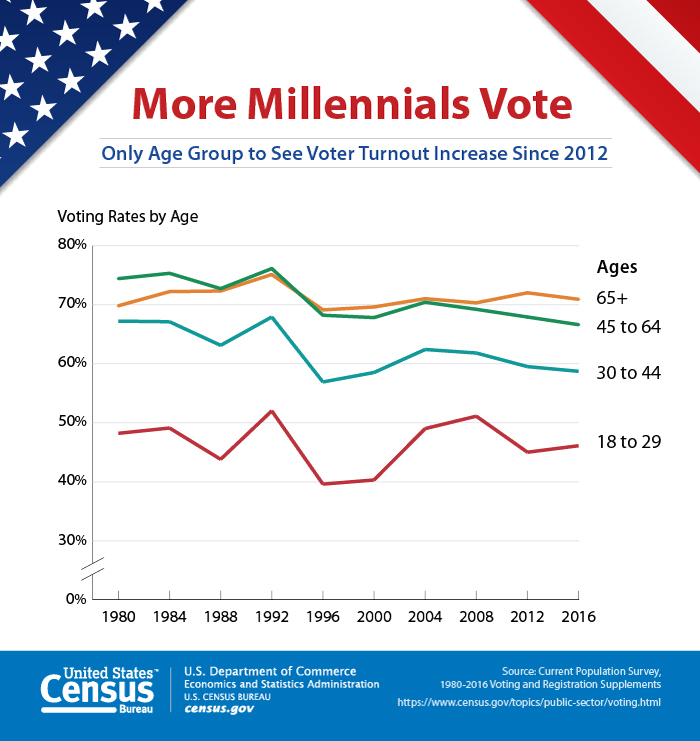 This enlightened new breed of socialist, progressive, communist politicians know is that there is a large, ignorant, and well indoctrinated voting bloc, the only group with a voter turnout increase since 2012, out there waiting for them, already prepped and needing to hear the right words tied with the pretty bow of social justice. Will they follow the Pied Piper? Yes, many will. Right down into the depths of hell. They will because they’ve been conditioned to believe that America is what’s wrong with the world and that America’s current leader is the worst of the worst. It is a dangerous and deadly game played by politicians and activists and someone forgot to give the rule changes to the establishment old guard. We are on the front end of a political rebellion. It may fall flat, crushed by establishment Washington. It may change the face of politics for generations to come. It began with the election of Donald Trump. According to the political class, Trump had no chance to win. They were laughing at the thought of it. What these people, so far separated from middle-class America and the middle-class values that bind our nation together, thought was that everything happens and all knowledge exists behind the establishment wall. They knew who was supposed to be next and it wasn’t Trump. A middle-class rebellion of American loving working people had a different idea. They went after Trump with everything they had in the intel community and the Department of Justice before, during and after the election and he’s still there. Now the counter rebellion of utopia peddlers is on the move. Establishment Washington values, Middle-class values, and progressive, socialist, communists’ ideals cannot coexist. It’s time to decide where you stand. © 2019 J. D. Pendry J. D. Pendry’s American Journal.